Note: The word for “holy” also means glorious, radiant. By the command of the Creator the result is obtained. Note: “by the command” can be translated as from the command. “By the command of the Creator” can be translated as by the direction of the doer. “Doer” can be translated as maker. Note: “non-eternal” can be translated as transient. “progress” can be translated as motion. Note: “to be done” can be translated as to be practiced. “japa” is repetition of a mantra. “contemplation” can be translated as reflection, thinking. “succession” can be translated as proceeding, order. “in that succession” can be translated as because of the order. The word for “superior” appears in the first line of the Sanskrit text and can be interpreted as pertaining to “the body, speech, and mind,” as well as to their respective practices. Note: “the universe” in the first translation is literally of the universe. The word for “worship” in the first line also means service. In the Tamil version, the first line states only “worshiping” according to Sri Sadhu Om and Michael James. The word for understanding can also mean mind, meditation, spiritual thought. “bearing” can be translated as wearing. The eight forms are the earth, water, fire, air, space, the sun, the moon, and humankind. Note: “Superior to hymns of praise” can also be translated as better than excellent praise, in which “better” is to be inferred. “loud” can be translated as intense. “or” in the first line is implied. “soft” can be translated as gentle, slow. “japa” in the first line is implied. “Mind-born” can be translated as mental. Citta-jam, mind-born, also means love or heart-born. “or” in the second line is implied. Note: “stream” can be translated as flow, current. “even” can be translated as smooth, equivalent. “continuous” can be translated as correct, straight, sincere. “contemplation” can be translated as reflection. “superior to” can be translated as better than, beyond. “intermittent” can be translated as interrupted, with interstices, sparse. Better than a conception of difference is that “I am He,” thus. The same word for “conception” in the first line is translated as “meditation” in the second line. In the first line, it can be translated as conception, meditation, or imagination. “of difference” can be translated as with differentiation. Therefore, the first phrase of the first line can be translated as Better than meditation with differentiation. “I am He” is literally He I am. “without difference” can be translated as without split, without separation. “holy” can be translated as purifying. In the Tamil version, the meaning in line two is, “is preferable” according to B. V. Narasimhaswami. Devoid of bhava is being well-established in true Existence. Note: “bhava” (bhāva) means conception, thought, supposition, state, becoming, world. “true Existence” can be translated as true Being. “is being well-established in true Existence” can be translated as is the well-being of true Being, or as is the excellent position of Real Being. “the supreme” can be translated as the highest. Note: “place” can be translated as ground. “Self-abidance” can be translated as being the Self, being in one’s own natural state, being at ease. “action” can be translated as purificatory action, ritual. “yoga” can be translated as union. “certainly” can be translated as it is ascertained. The Tamil text begins this verse with, “Absorption in the source,” according to B. V. Narasimhaswami. Note: The word interpreted as “prana” means breath, air. “Prana” means vital air, life breath, vitality, animating life-energy. “dissolves” can be translated as disappears, settles, adheres. “a means” can be translated as a practice. “control” can be translated as prevention, checking. Note: vāyavaḥ literally means relating to wind or air. It is interpreted here as “prana” and could be translated as breaths or prana-s.
“combined with” can be translated as connected to, endowed with. Mind and prana are the connections of Consciousness and activity. Mind and prana are combined with (connected to) the activity of Consciousness. “and are two branches” is literally of two branches or from two branches. “rooted in sakti” can be translated as of the same source of power. “same” is implied. Dissolution and utter destruction are both control. Note: “are both control” can be translated as are two kinds of control. From the binding of the prana, the mind is dissolved. Note: “binding” can be translated as suppressing. “is dissolved” can be translated as merges. “From one thought” can be translated as from thinking of the One, from contemplating the One, from a singular contemplation. “reaches” can be translated as enters into, comes to. In the Tamil version, instead of “from one thought,” the second line begins with the one path or the path of knowing or the path of becoming one, according to Sri Sadhu Om and Michael James. Note: “exalted” can be translated as excellent. mānasa, translated as “mind,” means belonging to the mind or in the mind. “Self-abidance” can be translated as abidance in his own natural state. The word translated as “since,” “because,” and “for which reason” can be translated as of which, as, because of which. The seen warded off, the mind is of the Self. Note: “The seen” can be translated as the perceivable, the objective. “warded off” can be translated as prevented. “The seen warded off” can be translated as turned away from the seen. “the mind is of the Self” can be translated as the mind itself, though this translation is potentially applicable only in the second interpretation. In the second interpretation, “this is” is inferred. 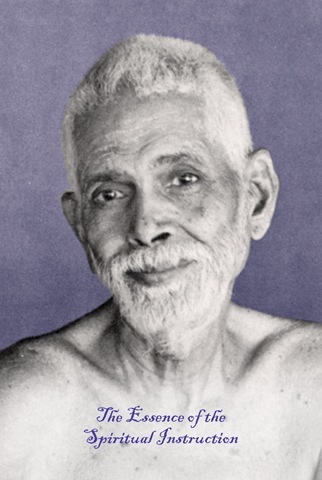 In the Tamil version, the equivalent of the first line says: The mind knowing its own form of light, according to Sri Sadhu Om and Michael James or its own effulgent form according to B. V. Narasimhaswami. Note: “seeking” can be translated as investigating, searching. “upon seeking” can be translated as upon having made the searching, on the investigation being made. “direct” can be translated as straight. Modes of the mind, now, are dependent on the “I” mode. Note: “of the mind” is implied. vṛtti means mode or condition of the mind and, thus, by interpretation, a notion or a thought or an activity of the mind. vṛtti can also be translated as mood of the mind. “the ‘I’ mode” can be translated as “I” notion. Note: bhāji means participating in, connected to, resorting to, relating to, in which is conspicuous. So, “Upon the destruction of the ‘I’” can be translated as connected with the destruction of the “I” or as in which the destruction of the “I” is conspicuous. “by itself” can be translated as of its own. Upon the dissolution of the “I,” though, the undissolved Being is. Upon the dissolution of the “I,” though, it is undissolved Being by nature. Upon the dissolution of the “I,” though, it is undissolved on account of Existence. Note: “viewed as” can be translated as called by. The word for “word” and “portion” also means abode, characteristic, state. anvaham, “every day,” can also be interpreted as anu-aham, following I, along with I, according to I. “Upon the dissolution” can be translated as in dissolution. “dissolution” can be translated as merger. ahami-līna-ke'pi means upon “I” dissolution whatsoever. Complete abidance as the Self is the revelation of one’s own Self. Because there are not two kinds of Self, there is firm Self-abidance. Knowledge abandoned, ignorance abandoned, Consciousness is. Note: “abandoned” can be translated as excluded. “difference” can be translated as another. The word for “difference” or “another” can also mean interior, intimate, the heart, the supreme soul. So, an interpretation of the second line could be: Is there knowledge to know the interior? The Tamil text does not seem to lend itself to this interpretation. Note: “true nature” can be translated as one’s own nature. “upon” can be translated as in. “immutable” can be translated as imperishable. “birthless” can be translated as non-entity. “making perfectly full” can be translated as satiating. Note: “the supreme happiness” may be interpreted as the Supreme, Happiness. “the jiva” means the individual, the life. “certainly” may be translated as but, then. “Supreme” may be translated as Absolute. Note: “Free from ‘I’” can be translated as “I” gone. “innate” can be translated as constant. nija-vibhānakam can also be interpreted as the Light of the Self, or the Light of one’s own Self. Tapas (tapaḥ) is intense meditation or fiery austerity. “the saying” can be translated as the spoken word, the speech.